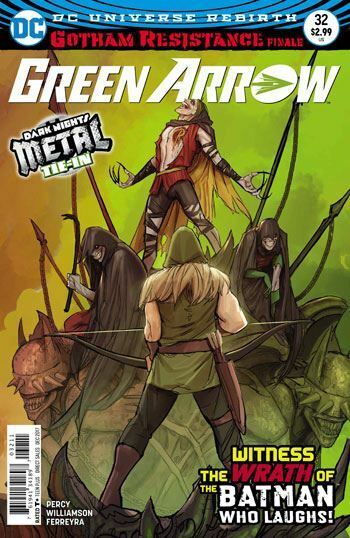 Green Arrow does appear in the latest issue of his own book, but the Gotham Resistance storyline takes prominence, and Oliver has to share the action in this book with Nightwing, Robin, Mr Terrific and Harley Quinn. I have to credit that the recap that opens this story is beautifully rendered, and really helpful. I have found parts of Metal confusing, and the recap told the story in a very clear way. Mr Terrific joined the other heroes at the end of the last chapter, and manages to take command of the group. That’s not such an easy thing with Damian and Harley Quinn to deal with, but Terrific knows more about the larger picture than the rest, and is able to give a grounding to the group. 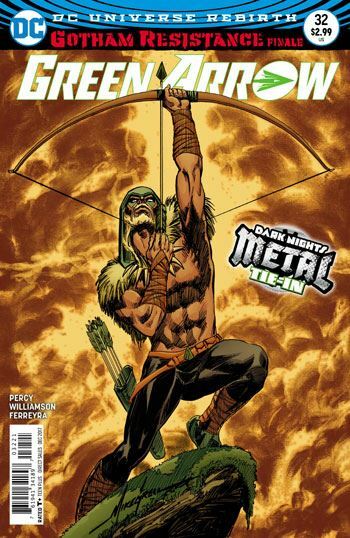 As with the previous issue, the heroes are forced into battle with dark, twisted versions of the Suicide Squad, who are dark and twisted already. It’s an adventure that has a lot of fun with the variant characters, but also has some really heavy and touching moments. Another hero joins the team before the issue is over, and though the heroes do not stop any of the big bad stuff from continuing, they do make a critical discovery, which more or less counts as a victory. Although Metal is just getting started, the Gotham Resistance story arc has been a well told crossover within the larger tale, and the high point so far, in my eyes.